The last time I visited the BA lounge in Boston was some years ago. When my travel companion and I visited the BA lounge last month, the lounge was vastly different from how I remembered it. That’s because BA had done a new/re-designed lounge in Boston. The good news: The change is for the better. I can’t say I’m too surprised since BA had some nice lounges in their portfolio. I remembered being super impressed with the Galleries First Lounge in Heathrow, both in terms of the size of the lounge (massive!) and food selections (delicious!) Shockingly, I wasn’t nearly as impressed by the Concorde Room. I had a lounge invitation flying on a premium cabin on CX on an international flight (oneworld). Since I am also a Priority Pass member, I also could have visited two Priority Pass lounges in terminal E.
One is to “the Club” lounge, but the decor there seemed a little uninspiring. The other is the Air France lounge. I only visited the lounge once, but I still remembered it as a decent lounge with light food and snacks. If I didn’t have access to the BA Lounge, I would have chosen the Air France lounge. I think my experience had been different than others. Granted, I was at the airport on the eve of a noreaster, not knowing if my flight in the early morning would get cancelled. There was only a handful of other passengers in the lounge. So it wasn’t crowded. At all. When I got to the lounge, most of the lounge staff appeared to be winding down or cleaning up. I didn’t see options at the hot food bar section – it looked like they had shut down the stations. I also didn’t see a bartender at the bar at the back of the lounge. Not that I was as hungry (there are still snacks and I was saving my appetite for the onboard meal) or needed a drink. I just thought it was bit of the unusual side, but I chalked it up to the impending storm system. There is plenty of seating at the lounge (more in the back of the lounge, not pictured here). The hot food bar is to the left of the image below. Despite the what looks like comfortable chairs near the windows (they really aren’t that comfortable if you want to get some shut-eye), I settled near the food pantry area so I could snack (and work on my laptop). SinceI love chocolates, I couldn’t resist the urge to make myself a cup of hot chocolate (the mix was mediocre, but I was thankful for a warm drink). I am a queen of junk food, so I also dipped into some Oreos cookies. British Airways has done a nice job with their Boston lounge. Traditionally, the lounges in the states aren’t nearly as impressive compared to some lounges in Asia and Europe (CX’s lounge in Hong Kong and BA’s lounge in Heathrow immediately come to mind), but they are getting better. In fact, I had a decent visit at the Delta SkyClub lounge in Seattle on my return. I hope other carriers are taking notes, since the BA lounges are generally ahead of the curve in this regards. If you have the chance to visit the new BA lounge in Boston, definitely check it out. I recommend it. Have you visited the BA lounge in Boston since their re-design? What did you think of it? 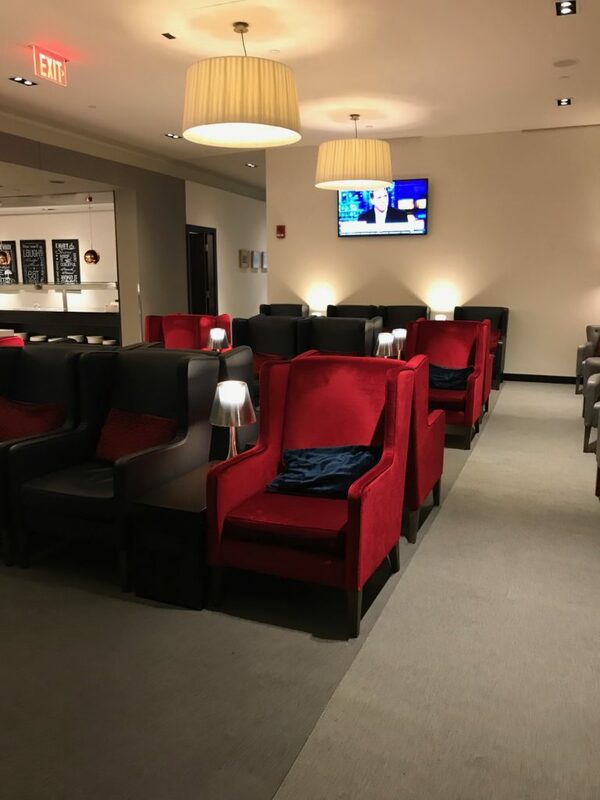 The post Review: British Airways Lounge at Boston Logan International (BOS) Airport appeared first on TravelUpdate. ← BA Award Redemption: Availability Hack?